Do you have a collection of baseball caps featuring team and company logos? Do they stay on the floor of your closet or littered around the house? Here is your opportunity to organize your collection and display them using our hand-crafted cap racks at a reduced price. 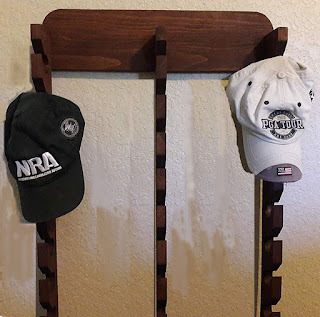 This holiday season we are offering 10% Off all three of our hat rack styles between November 10 and November 26, 2018. If you place your order now, your cap rack will arrive in plenty of time for the Christmas holidays. Choose between sizes: single, double and triple cap rack sizes. Each rack comes with hardware for easy hanging. You can select a stain that matches your home furnishings. Mix and match the sizes if you have a very large collection. Copyright by Arttowngifts 2017. Powered by Blogger. Welcome to the Arttowngifts Blog. Enjoy informative articles to make your gift shopping easy with gift ideas for every budget, occasion and recipient. Sign up for exclusive offers and the latest news from Arttowngifts. The Gifting Dilemma: Gift Cards, Gifts or Cash?? Gift Ideas from Arttowngifts Blog © 2016-2017. All Rights Reserved.